It seems the last two winters in Denver could best be known only as "sunset season". We've been pretty dry this winter, same as last, and the setups have provided many wave cloud sunset opportunities. So, in this off-season for severe weather, there isn't much for a meteorologist like me to point my stick at. This isn't the off-season everywhere, however. You just have to look south of the equator. 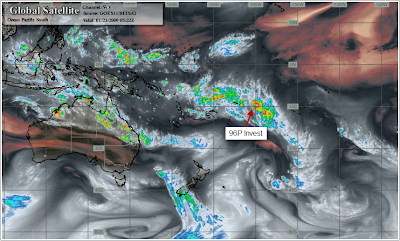 If you've been frequenting this blog recently, you'll notice a lot of attention paid to the Southern Hemisphere Tropical Cyclone Season. 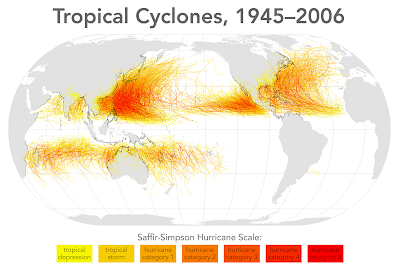 I found a great map on Wikipedia that shows the distribution of tropical cyclones across the globe. You'll want to click on this image for a much larger version. 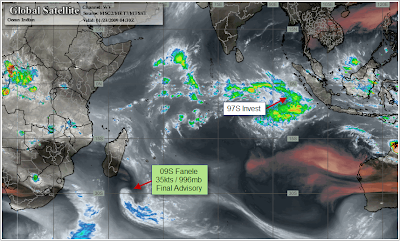 09S Fanele - The JTWC has issued their final advisory for this storm as it continues to drift to the south and east, into cooler waters. On the home front here in Denver, it didn't get quite as warm today. A few locales tipped 70ºF, but most hung around in the upper 60's. Driving into work this morning, I marveled at virga coming out of the standing wave cloud. A friend just told me he got a brief shower in Highlands Ranch today. There was considerably more moisture at the surface today, so I suppose that was possible. Big changes are coming though ... snow and freezing rain wiped out the stagnant inversion in Salt Lake today. Parts of Montana are under winter storm warning. I see the possibility of snow here tomorrow and we, I almost can't believe this, may have enough moisture for some!